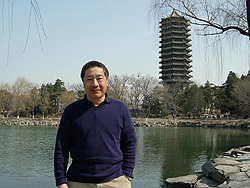 Douglas Lin on the campus of Peking University. Photo by Li Shulin. Douglas Lin, professor of astronomy and astrophysics at the University of California, Santa Cruz, has been named founding director of the Kavli Institute for Astronomy and Astrophysics (KIAA) at Peking University in Beijing, China. Lin will keep his faculty position at UCSC while he helps launch the new institute, one of two scientific institutes established in China last year with funding from the Kavli Foundation. "The aim is to build an institute that will be an international center of excellence to drive fundamental research in astronomy and astrophysics in that area of the world," Lin said. "It will be open to researchers of different nationalities, and the working language of the institute will be English, so it will provide a forum for visiting faculty to carry out collaborative research in China." The KIAA research program will focus on three major areas of astrophysics--particle cosmology, star and planet formation, and gravitational physics and high-energy phenomena. It will function as an autonomous institute jointly supported by the Kavli Foundation and Peking University. (One of China's oldest universities, Peking University has retained the traditional English spelling of its name.) The university will support faculty, researchers, and students at the institute and provide a new building to house it on the Peking University campus. "This is a great opportunity at a time when China is undergoing historic transitions," Lin said. "The economy is growing very fast, and the current government is interested in promoting basic research in areas such as astronomy. They are also going through educational reforms, and the president of Peking University, Xu Zhihong, wants to make it a top-ranked international institution of higher learning." Lin's plans for KIAA include establishing exchange programs with UCSC and other UC campuses, as well as other institutions around the world. "We can think about bringing exchange students back and forth, as well as postdoctoral fellows and visiting faculty. I see it as a winning proposition, and in the long run there may be opportunities for collaborative projects on a much larger scale," he said. The Kavli Foundation has established more than a dozen institutes at leading universities, mostly in the United States, but also in Holland, England, and now China. They promote fundamental research in the fields of nanoscience, neuroscience, and theoretical physics and astrophysics. In addition to KIAA, a Kavli Institute for Theoretical Physics was established at the Chinese Academy of Sciences. Lin said he feels equally at home on all shores of the Atlantic and Pacific Oceans. Born in New York, he grew up in Beijing, moved to Canada for high school, attended McGill University in Montreal, and earned his Ph.D. at Cambridge University in England. After postdoctoral positions at Cambridge and Harvard University, he joined the UCSC faculty in 1979. "I appreciate the cultural backgrounds of China, Canada, the U.S., and Britain, having lived at least a decade in each of those places," he said. After shuttling back and forth between California and China for the past ten months, Lin said that launching the new institute is both exciting and challenging. During the first two formative years, he expects to use sabbatical leave to spend half his time in Beijing. After that, he said he expects to spend about three months of each year at the institute. "My sense is that in the decades to come, China will make major contributions in many different fronts. If ever there was a time when one could make a difference in setting the direction of research for the future, now is the time, and China is the place," Lin said. "Just in terms of the talent pool, they have a lot of very smart and hardworking students. When you go there, you can feel that determination, that energy, and that drive--it is a winning combination of ingredients." Note to reporters: You may contact Lin at (831) 459-2732 or lin@ucolick.edu.